Claire Foy as Queen Elizabeth II in "The Crown." 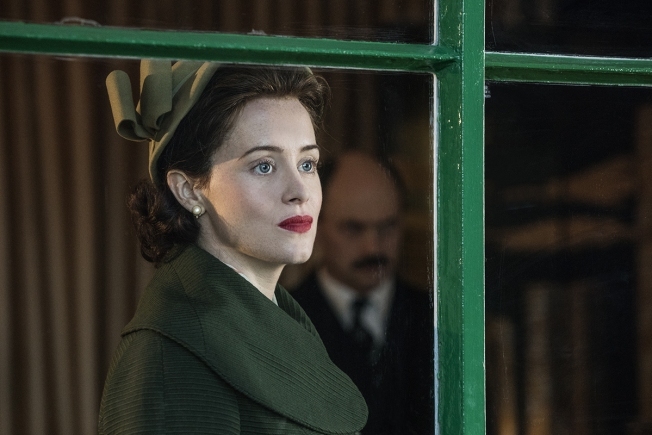 It's hard to imagine folks scraping by paycheck-to-paycheck feeling too sorry for Queen Elizabeth II or Claire Foy, who reportedly was paid $40,000 an episode to play her in "The Crown." Yet news this week that Matt Smith, who portrayed Prince Philip in the Netflix series, made more than Foy strikes at the heart of fairness — and common sense: Why does the queen get less than the prince? The controversy also links Elizabeth and Foy in new ways. They've both become, in different respects, symbols of Hollywood's battle against sexism. The salary flap underscores a major point of the show: Even powerful women aren't immune to blatant mistreatment. Foy's depiction of Elizabeth's battles against the men trying to control her life during her early reign resonates in current times. John Lithgow dishes on his surprising casting as Winston Churchill for Netflix's "The Crown" and returning to NBC for crime mockumentary "Trial and Error." The crux of the first two seasons of "The Crown" rested upon Foy, who brilliantly embodied the evolution of a living, historical figure who has offered rare, intimate glimpses of herself during nine-plus decades in the public eye. The show dramatized how the young queen got rolled by some of the men in her life, from the aging, mansplaining Winston Churchill to Philip, who chafed at his second-tier status. Even tied by bejeweled bounds of traditional propriety, Elizabeth struck back in season 2. She sent Philip away on an extended trip so he could grow up and helped kick Prime Minister Anthony Eden to the curb after the Suez Canal disaster. Smith, who likely commanded a higher salary because of his past star turn as Doctor Who, did a fine job as Philip. But Foy, who conveyed Elizabeth's growing steeliness, canniness and weariness with different degrees of brow-furrowing, emerged as the star of the show. Her performance also has spurred some to view Elizabeth in a new, more substantial light. Foy and Smith are done with “The Crown.” The new Philip hasn’t been tapped, but Olivia Colman is set to play Elizabeth in Seasons 3 and 4 as the show moves into the 1960s and beyond. The producers promised this week pay parity from here on. That passes for major progress in the Time's Up/#MeToo era, which has highlighted the systemic exploitation of even seemingly powerful women. Meanwhile, Queen Elizabeth, both a witness to history and a player, unexpectedly finds herself an ancillary part of a struggle that makes her, on some level, relatable to those who'll never wear a crown.